Sidney’s Clay Carter goes after Greenville’s John Butsch on Friday nigth at Sidney. Sidney’s Landon Johnson brings down Greenville’s Logan Sibery on Friday night at Sidney. 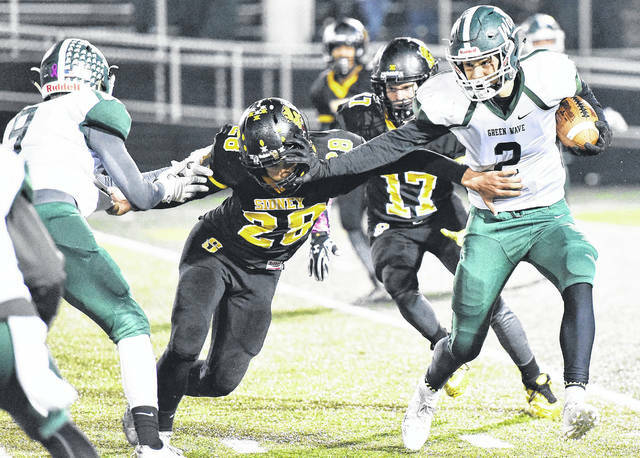 SIDNEY — Sidney senior running back Caleb Harris needed 110 rushing yards entering Friday’s Greater Western Ohio Conference game against Greenville to get 1,000 yards on the season. It came easily for Harris — as just about everything did for the Yellow Jackets in their season finale. Sidney built a five-touchdown lead by the end of the first quarter and cruised to a 56-21 victory over the Green Wave on Senior Night. It’s the third consecutive season the Yellow Jackets have claimed the Little Brown Jug, the traveling trophy between the two squads. “Having that Jug is important to those guys,” Sidney coach Adam Doenges said. “Having this rivalry game the last week of the year is neat and gives you something to play for. Sidney finishes 5-5 overall and 2-3 in GWOC American North play, while Greenville finishes 3-7 and 0-5, respectively. Harris, who also plays defensive back, reached 1,000 yards on a touchdown run late in the first quarter. He has been a two-way starter the last two years and finished third on the team this year with 47.5 tackles. He ran for 193 yards and four touchdowns on 19 carries on Friday. Sidney led 42-7 at halftime. The entire second half was played with a running clock. Harris scored on a 47-yard run with 5:40 left in the third quarter to boost the Yellow Jackets’ lead to 49-7. Greenville scored on a 4-yard touchdown pass from Tyler Beyke to Di’Maurye Ewing with 1:47 left, but Darren Taborn returned the ensuing kickoff 81 yards for a touchdown to boost Sidney’s lead back to 42 points. Beyke threw a 20-yard touchdown pass to John Butch with 10:06 left in the fourth quarter, which was the last TD of the game. Greenville got the ball to start the game and turned the ball over on downs at Sidney’s 27. It didn’t take long for the Yellow Jackets to score. After several runs by Harris, Ryan Dunham threw a 59-yard touchdown pass to Lathan Jones along the home sideline. Hallie Truesdale hit the extra point to put Sidney ahead 7-0 with 5:33 left in the first. Greenville went three-and-out on the next drive, and Sidney tipped the punt and got the ball at the Green Wave 35. Harris scored on a 10-yard run soon after to boost Sidney’s lead to 14-0 with 3:39 left. The Yellow Jackets scored again 20 seconds later. After a short gain on a run, Taborn intercepted a pass by Beyke and returned it 29 yards along the visitor’s sideline for a touchdown. After another Greenville three-and-out, Dunham threw a 35-yard pass to Roberts and Harris ran in from 38 yards out to put Sidney ahead 28-0 with 1:21 left. Lee recovered a fumble at Greenville’s 22 with 58.9 seconds left, then Harris ran in from 9 yards out a few plays later to push Sidney’s lead to 35-0 with 13.9 seconds left. Harris went over 1,000 rushing yards for the season on the TD run. Sidney finished with 319 yards of offense and didn’t have any turnovers, while Greenville had 288 and four turnovers. 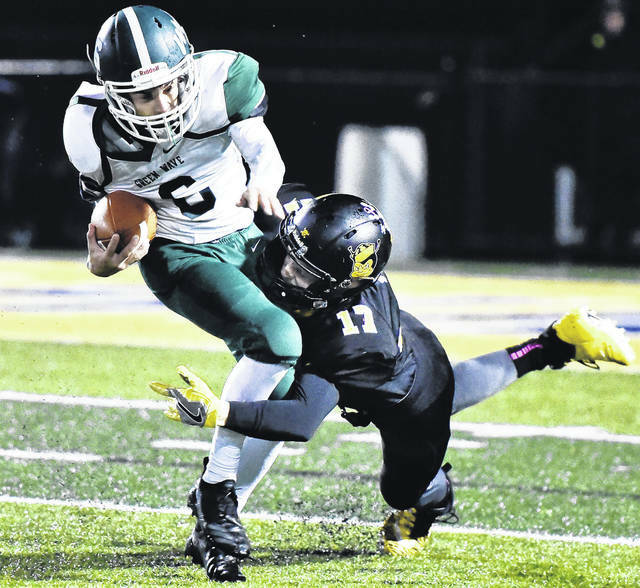 Friday’s game was the last for both teams as members of the GWOC. They’re among 10 GWOC American League teams that are leaving the conference to reform the Miami Valley League, which will start play next year. It was also the last game as Greenville’s coach for Aaron Shaffer. He was recently hired as the district’s new athletic director and will assume those duties in the next week. It also was the last game for 11 Greenville seniors. They are Di’Maurye Ewing, Ethan Saylor, Micah Light, Colton Zumbrun, Braiden Cattell, Calab Browder, Landon Eldridge, Matt Boltin, Dru Quinn, Nathan Fry and Jacob Goldsmith.